Tool to join together (merge) tracks from iTunes, chapterize them, and add them to your iTunes music library. Joins together MP4/AAC files losslessly without reencoding; joins other filetypes (or mixtures of filetypes) with reencoding to MP4/AAC at the highest bitrate of the input files. Video: Track Concatenator on YouTube. Program takes currently selected tracks from iTunes. Set the tags, then press "Concatenate" to join them. The joined track is automatically added to iTunes. Track Concatenator requires that you have MP4v2 and FFMPEG installed on your Mac. The easiest way is to install Homebrew. If you don't have these, you can install them on the first run. 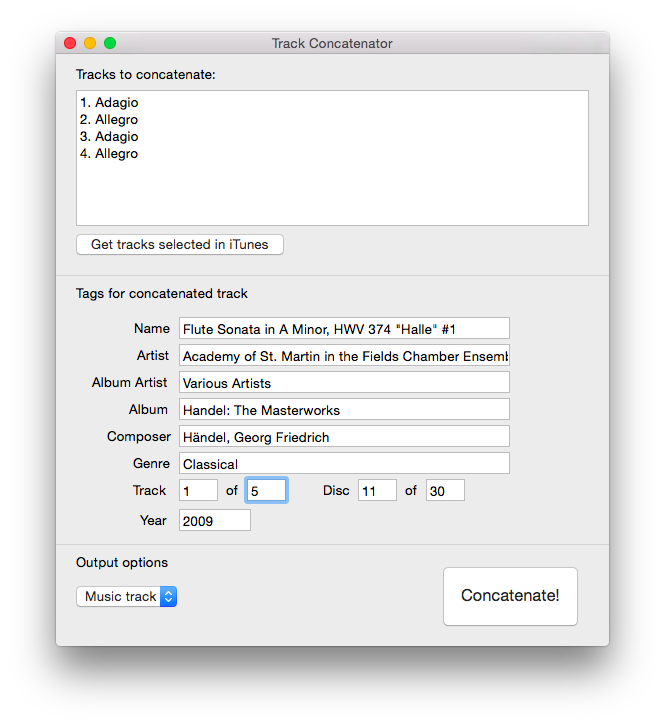 Note that Track Concatenator is not signed — to open, you may have to right-click, then select Open. Tested on macOS Mojave, Mavericks, and Yosemite — may work on earlier versions of OS X. Source code is on Github. See also the list of known issues.